Image used in a video. Link to video at bottom of this page. I was wondering if anyone has asked about the sign before? I'm sure you realize now the sign (the exact picture) was in the video for "All your bases are belong to us." You see, my computer is pretty old and I haven't kept up with the latest fads, but my friend was showing me the video and I knew that was the same picture from your web site. I was just wondering if you gave the picture to them or did the people copy it off your web site? The story of the video is that a video game from 1989 was being translated for the first Sega console and the translations didn't come out to well from the Japanese interpreter. Someone about three or four years ago posted the humorous lines of bad dialogue to a forum and people were using them as sort of inside jokes. Another person added music to the actual screen shots and put it on the web. 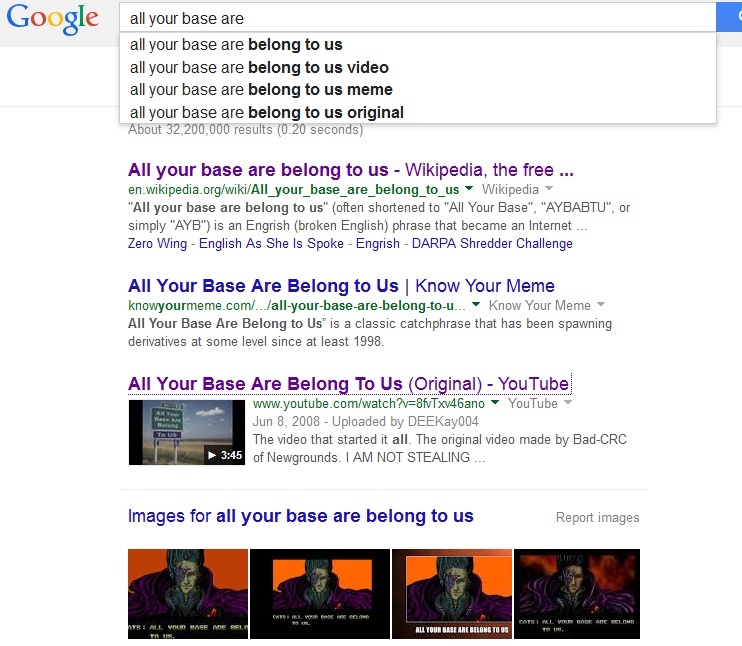 Then ANOTHER person added pictures from the Internet with the saying "All your base are belong to us" photoshopped into the picture (stuff like McDonalds, billboards, road signs,etc.) I guess it was supposed to look like some sort of conspiracy or alien invasion. link: See bottom of page. 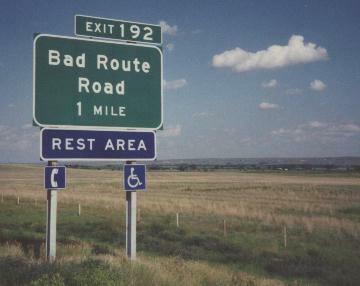 "This photograph was taken by Emma and David Hess in April of 1997 on a remote highway in rural Montana. They claim to have returned to the same location 6 months later, only to find the sign had been removed." Robert, it was interesting that they used your picture there. That's quite a compliment. However, the funny thing is that they took the most interesting thing about the picture, the wording, off. But maybe that picture had the distinction of being used precisely because it was so interesting, even though you now can't tell what was so interesting about it looking at the video. Also, a Google search on May 3 2014. My sign photo contributed to the thumbnail.